The Ploctones. A group with a rare solidity, determination and flexibility. A genuine four-headed monster. Whether it concerns a rhythmic tour de force, a fun idea or a tearjerker, the quartet always sounds solid and the group members never cease to surprise each other. The changes and shifting times are whizzing past our ears. The band of Anton Goudsmit, winner Devil 'best pop gitarist' and VPRO Boy Edgar Award for jazz, has together with saxophonist Ephraim Trujillo, bass player Jeroen Vierdag and drummer Martijn Vink poured down on new notes, new rhythms and new grooves. After many years of service to the indomitable New Cool Collective, Goudsmit is now fully devoted to his own anarchist gang. The band already plays almost a decade in this formation and they never get enough of it. The men are evenly matched and surprise each other constantly with quirky input and intense interplay. 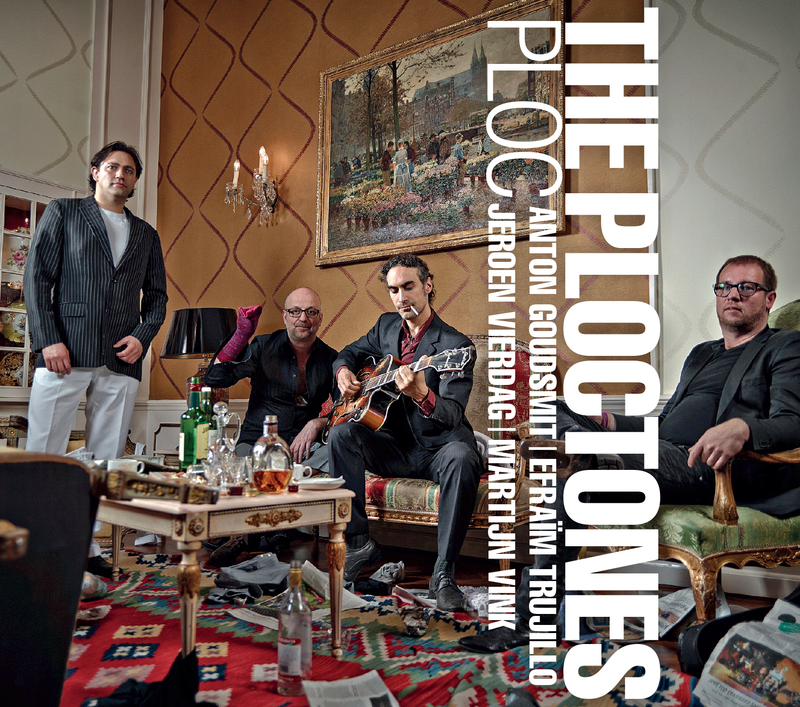 'Ploc' is already the fourth album by The Ploctones. The inside of the arwork is provided by Typex - known for his cartoon illustrations of music, movies and arts. The booklet can be unfolded to a poster which Typex illustrated a comic story about the cover photo. Challenge present on the JAZZDAG! North Sea Jazz Festival this weekend! "["].. Impetuous , poetic, rowdy , compelling , controversial and surprising."" "With 'Ploc' The Ploctones produced a record again that spans the full width of jazz music. Filthy funk to ballads, everything is represented." ""Their music is often described as a very creative and innovative; masters at improvising""
"Ploc is a remarkable album." ""Hard, vile and very precise!"" ""This is a CD that will not get bored and recommended for lovers of contemporary jazz rock""
"All ingredients of the past are still present, they are only bolder, more extreme and therefore better"
"One of the most responsible party jazz bands of our country"
"Playing more eager than the quartet [...] is hardly imaginable. " " The product is dynamic and awesome "
""Also Ploc make some kind of unexpected movement to the listener, but that makes the experience of this band precisely to such an exciting roller coaster experience""
""Very touching and romantic how the guitar and sax are looking for each other and how strong the energy of the music goes high and low like in Giuseppe" "
""A blues from The Ploctones can ofcourse not be without silliness. Perhaps indeed the best band of the Netherlands""
"Broadening and subtlety and the irrepressible appetite for explosive music, go effortlessly together on 'Ploc'. A versatile album from a band in top form." ""A highlight is the wonderful Giuseppe, an emotional trip up build of guitar layers that result in an infectious turbulence""
"The Ploctones is not only a fantastic group of impressive players, it is also a group in which the individual voices are used to their full advantage. "